Description: The sCare Foundation - a newly founded non-profit organization whose goal is to alleviate the hardships of poverty and homelessness facing North American youth - presents their inaugural fundraiser. Halloween-producer Malek Akkad hosts the event to benefit the CHAMPION Fund at Children’s Hospital Los Angeles and support the programs of the Hollywood Homeless Youth Project (HHYP). 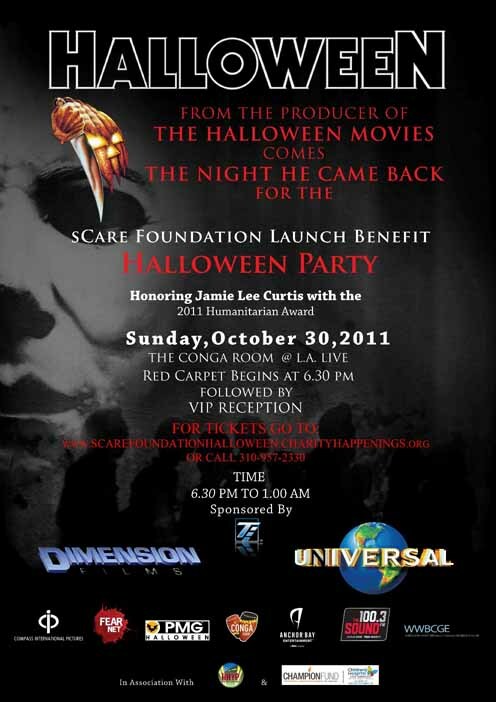 The foundation will give its first-ever Humanitarian Award to two-time Golden Globe® winner Jamie Lee Curtis (the original Halloween). Also scheduled to appear: Award-winning producer Quincy Jones, Malcolm McDowell (Easy A, Halloween), A.J. Bowen (A Horrible Way to Die), “Dancing With The Stars” talent, Christa Campbell (The Wicker Man), Andrew Divoff (Indiana Jones & the Kingdom of the Crystal Skull), Sybil Danning (Halloween), Ken Foree (Dawn of the Dead), Priscilla Barnes (Three’s Company), Guillermo Diaz (Half Baked, “Love Bites”), Jon Mack (Saw VI, “Introducing Dorothy Dandridge”)Adam Green (Frozen), Joe Lynch (Chillerama, Knights of Badassdom), Adam Rifkin (Underdog, Chillerama), “The Sopranos’” Jamie Lynn Sigler, Max Landis (writer of Deer Woman, Frankenstein), Drew Dowdle (Quarantine), John Dowdle (Dark Reel), Wayne Kazan (TMNT, The Good Girl), Paul Solet (Grace), David Boxerbaum (Spoof! An Insider’s Guide to Short Film Success), “Still Game” Carolyn Conrad and many more!